A University of Liverpool student has been awarded a British Psychological Society summer studentship to look at the effects of alcohol advertising on choice and behaviour. The study is exploring whether intoxication can change the way a person behaves [don't laugh—CJS] including how they respond to positive and negative alcohol advertising. It will measure the effects of different advert types on choice behaviour when the participants are both sober and intoxicated. The expectation at the outset of the study was that intoxication may strengthen the underlying motivation to drink in a typical drinking environment, with positive adverts having a greater influence while negative adverts may be ignored. Nothing indicates 'quality, impartial science' better than having an "expectation at the outset", does it? If these possibilities are confirmed once the study is complete, it could inform health strategies aimed at reducing the occurrence of binge drinking, as well as raising questions about whether the level of positive alcohol advertising in drinking establishments should be reduced. They know what conclusion they want and they know what policy they're working towards. It's as if the spirits of Darwin, Galileo and Newton have merged into one! Long live rigorous scientific enquiry. I don't know about you, dear reader, but I'm on tenterhooks. Who knows what conclusion this study will arrive at? Who knows what findings will emerge once this distinguished and impartial scientist has finished her scrupulous work? Which way will the dice fall? It's just too early to say. Up to 4,000 pubs will close in the next year, but they are ones "stuck in the 1980s" offering indifferent drink and food, according to a new guide. The smoking ban was always part of a wider agenda of the professional classes to cleanse British social life of traditional working class culture. Many crocodile tears have been shed about the shocking decline in the number of pubs, bingo halls and working men's clubs that followed the 2007 legislation. Rarely, however, has their delight at the success of this social engineering project been expressed so shamelessly. The aim of the chattering classes is not unlike that of the early Anti-Saloon League—to rid of the country of what they see as the scourge of drink-led, politically incorrect, smoke-filled, privately run, child unfriendly, sports-watching boozers that are frequented mainly by working class men—pubs that have customers who are indifferent to food because they don't go there to eat. Proper pubs, in other words; havens from sterile, prod-nosed Britain. A place for grown ups. When politicians and metropolitan pundits disingenuously pay homage to the 'great British pub', these are not the kind of establishments they have in mind at all. Their vision of a pub is essentially a mid-priced restaurant with horse brassings on the wall; somewhere to take their children on a Sunday afternoon. Somewhere to read The Observer for four hours while nursing a solitary pint. So when a bien pensant like Mark Easton says that "pubs aren't dying - they are evolving", he means that pubs are dying, but that's okay because there are more bistros and restaurants opening up (albeit in much smaller numbers) and they serve a fine cup of coffee. 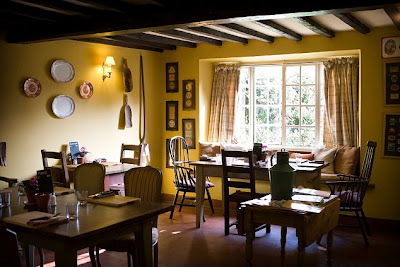 The photo below shows the winner of Pub of the Year according to the Good Pub Guide. I'm sure it's a very agreeable place, with its Cold Pressed Ox-Tongue, Caramelised Onions, Watercress & Cashel Blue starter and Olive & Rosemary Gnocchi, Globe Artichokes, Tomato & Sweet Pepper Coulis main (£24.95 for a set menu), but it's not really a pub, is it? "Pubs closing keeps the trade healthy and robust. They have got to diversify if they want to succeed – they just can't open for lunch and open again in the evenings any more." The arrogance is astounding. As anyone who has followed events in the licensed trade over the last few years knows, many pubs have reduced their opening hours because fewer people are coming in during the afternoon. The classic afternoon regulars—often retired—who pop in for a few pints and a smoke have been driven out. Needless to say, neither The Guardian nor The Telegraph even mention the smoking ban as being a factor in pub numbers plummetting from 2007. Steve Kemp, political officer of the GMB union, said: "The report identifies that there are thousands of pubs that have not been refurbished, where the offering to consumers is outdated. "The report does not identify the root causes as to why these pubs that survived the depression and the war have been starved of investment. It's the smoking ban, Steve. That's the biggest thing. “Action to address the root causes rather than closing them is the answer for staff and for local communities." So amend the smoking ban. Give landlords the choice. No one denies that the pubs that close are the ones that do not cater to people's tastes—that is self-evidently and trivially true. The question is whether publicans are unwilling or unable to cater to people's taste. In a free market, it's survival of the fitness, but pubs do not operate in a free market. They are burdened by some of the highest alcohol taxes in the world and one of the most draconian smoking bans in the world. This amounts to rewriting history. There were very few non-smoking pubs in the free market that preceded government coercion because they were financial suicide. That all changed when financial suicide became the law on July 1st 2007. Since then, the first preference of millions of people—to have a drink and a smoke—cannot be catered for by pubs except—on sunny days—in a beer garden (and the squealing, spoilt children of 'public health' have got their eyes set on those too.) This is not because pubs are unwilling to cater for their customers—they have been doing so successfully for centuries—but because the law does not allow them to do so. And since there is a massive socio-economic divide in smoking rates (see below), a pub's ability to survive largely depends on the demographics of the area in which it happens to be situated. These are not "bad pubs" in an economic sense. They are capable of prospering. They are "bad pubs" only in a moral sense, according to the preferences of the snooty Good Pub Guide and The Guardian. To say that these people don't care about thousands of pubs going bust is to misjudge them. They are over the moon. I've just seen this, one of three Guardian articles about pubs today that ignores the elephant in the smoke-free room. On the upside, there's been a boom in the kind of punky microbreweries that feature in John's beer festivals... Pop-up pubs such as Beer Rebellion in Gipsy Hill. But Amanda Hone, the manager there, has bigger plans. She's negotiating with the giant property group Spirit to re-open the moribund Royal Bell in Bromley as a new breed of pub. One that serves as an art space, a pocket museum, a focus for school trips. A community hub if you will. People like John and Amanda represent the future of pubs. God help us. This is exactly what I'm talking about. Brian Monteith hits the nail squarely on the head in this article about the looming EU ban on menthol cigarettes. Like the ban on snus, it's being done only because its users are a minority of a minority and are therefore unable to kick up much of a fuss (sound familiar, e-cigarette users?). What is it about menthol cigarettes that is making them one of the targets for Tobacco Control? Is it a flood of anecdotal and scientific evidence that suggests menthol cigarettes are the entry to a lifetime of smoking? Do we see menthols in the movies, the soaps, Hello magazine photo shoots, hanging off the lips of X-Factor celebs, celebrating cricketers or the latest bad-boy role models? After looking at the available information the only possible reason I can find that Tobacco Control is targeting menthol cigarettes in Europe and the USA is that there is enough negative prejudice amongst smokers and non-smokers alike for it to identify menthol as the soft-underbelly of tobacco products; a minority pursuit amongst a minority that can be picked-off and banned. It is a classic case of divide and rule that will, of course, not end there but will proceed to a ban on something else such as non-filter tipped cigarettes, constantly assaulting and marginalising the smoker until the ultimate ban of cigarettes altogether might be contemplated. It's tiresome and exhausting to have to protest every illiberal act of the 'public health' tyrants, but sadly it is the only way to have your voice heard, so please join me in signing the petition against the Tobacco Products Directive here. Within a few weeks it could be all over bar the shouting. And do go read Monteith's sensible and well-researched article about the menthol ban. My God, he's drinking as well! 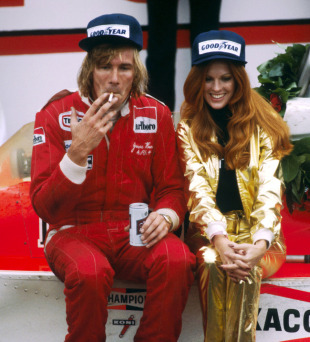 Stanton Glantz wants smoking and cigarette logos removed from trailers for Rush, a film about a racing driver who smoked and had a Marlboro logo on his car and jacket throughout his career. @cjsnowdon Right. Because smoking was the most dangerous thing about motor sport. And don't forget this Formula One-related paranoia from 2010. Oh, and Glantz's one man crusade against Avatar. In the war against e-cigarettes, you might expect Big Pharma to seek a rent-seeking ban in order to preserve its share of the nicotine market. Similarly, you might expect Big Tobacco to seek restrictions on this new competitor to the cigarette industry. Stop smoking services face a new era of challenges due to the rise of the electronic cigarette, health chiefs have warned. ... Adrian Butterworth, smoking cessation manager at the Crompton Health Centre, said: “Our services have been described as ‘jewell [sic] in the NHS’ crown and we couldn’t be more proud of that achievement. ... “We have seen a slight down-turn in people using our service in the past year and we think it is down to e-cigarettes. Smokers think they quitting by using one but in fact they are not. It’s just another way of smoking." You'd think that someone who runs a smoking cessation centre would know what smoking is, wouldn't you? That it involves fire, combustion and burnt matter, for example. 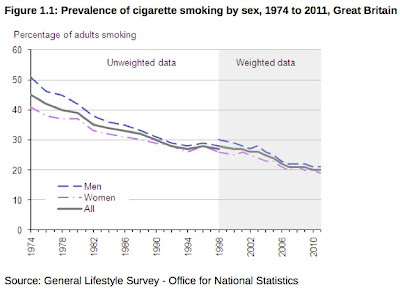 No wonder their success rate is so pisspoor and no wonder smokers are abandoning them in favour of e-cigarettes. 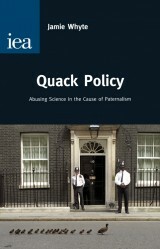 My blog post at the IEA discusses Jamie Whyte's book Quack Policy and its critics. Health experts who recommended that the Government tighten the regulation of electronic cigarettes failed to declare their financial interests in Big Pharma’s rival products. ... At the meetings held at the MHRA’s London headquarters in May 2011 and January this year, the chairman asked the expert panel to declare any interests. Minutes of the meeting in 2011 obtained by The Times under the Freedom of Information Act show that “no interests were declared by members”. However, some members of the panel worked as consultants for big pharmaceuticals companies and advised on nicotine. ... Paul Aveyard, Professor of Behavioural Medicine at the University of Oxford, is a consultant to McNeil and Pfizer on nicotine replacement therapy and nicotine vaccines, respectively. Professor Aveyard, who helped to produce guidance for doctors on prescribing licensed nicotine products, is also a for-mer consultant to Xenova, which developed vaccines for nicotine addiction. Martin Jarvis, a Professor Emeritus of Health Psychology, University College London, and vice-chairman of the board of trustees of the anti-smoking charity Action on Smoking and Health, is a paid consultant to Pfizer. He has advised on an ingredient of Pfizer’s drug Chantix, treating nicotine addiction. Christopher Marriott, formerly Emeritus Professor of Pharmaceutics, King’s College London, holds shares in three pharmaceuticals companies. One is Vectura Limited, part of Vectura plc, a FTSE 250-listed company whose inhalation products help to combat chronic obstructive pulmonary disease, better known as smoker’s lungs. Secondly, the Polish press has been investigating the influence of Big Pharma on the EU's Tobacco Products Directive. The article—from Uważam Rze—isn't available online so I'm grateful to David Dorn for sending me the English translation. Do we stand to lose because of pharmaceutical lobbyists in Brussels? Work is continuing in the European Parliament on the new tobacco directive, which is to ban the manufacturing and marketing of menthol and slim cigarettes. This blow to smokers is, as always, motivated by concerns for our health. However, according to our information, there is more to this matter that meets the eye. If the regulations currently being drafted come into force, pharmaceutical concerns stand to profit. Tens of millions of euros per year are at stake, so lobbying at an unprecedented scale is taking place in Brussels. The rapporteur of the draft is Linda McAvan, a British MEP from the Socialists and Democrats faction. She is a well-known anti-smoking activist. It is worth observing that the start of her work on the Tobacco Directive coincides with David Harley, former high-ranking S & D politician and colleague of the MEP in the presidium of this faction, joining the Brussels office of the lobbying firm Burston-Marsteller whose clients include some of the largest pharmaceutical companies, including Johnson & Johnson and Pfizer, which may earn millions on smokers. “Money is the only thing that counts in this matter” says Zbigniew Ziobro, MEP (Solidarna Polska). “A huge lobbying effort is under way. Lobbyists are chasing all MEPs. I have never met with them, but they continue to offer trips and dinners. This is barely disguised corruption, unmasked last year by a provocation arranged by British journalists, where three prominent MEPs promised to push through a piece of legislation for EUR 100,000” – the former justice minister added. Not surprisingly, in November 2011, the bosses of the largest companies in the pharmaceutical sector, such as Johnson & Johnson, Pfizer and GlaxoSmithKline, sent a letter to the President of the European Commission, Jose Manuel Barroso, demanding that the work on the introduction of the new Tobacco Directive be sped up [I discussed this letter back in 2011 - you can read it here - CJS]. What is more, they demand that no research be done into the consequences of the new regulations. “Of course, an impact assessment is very important in creating responsible legislation, but, as stated in a resolution of the European Parliament regarding independence in assessing the impact of regulations, it may not “lead to greater bureaucracy and unnecessary delays in the legislative process” and “be misused as a means of blocking undesirable legal provisions”. In addition, an impact assessment does not replace the policy development process conducted by the Council and the Parliament. We are of the opinion that further delays are unacceptable” – we read in the letter. However, this demand was signed not only by the heads of the concerns, but also by Deputy McAvan. “This provides a serious reason for questioning whether the rapporteur is really impartial” – Andrzej Grzyb MEP (PSL) commented our information. Pharmaceutical companies argue that their lobbying in favor of the new directive stems from their concerns for human health. This is one side of the coin. However, it is also true that every additional restriction placed on smokers is worth a fortune for them in the form of increased sales of their pills, patches or chewing gum designed to help people quit smoking. In addition, concerns want e-cigarettes to be registered as a medicinal product, allowing them to increase their profits even further at the expense of tobacco companies. Interestingly, on 8 May of this year, a training course was held at the EP devoted to e-cigarettes. It was organized by … McAvan, MEP. She said that they should be classified as medicinal products, regulated as such, and that flavored versions should be banned. In reality, this would mean that only pharmaceutical concerns would be allowed to market e-cigarettes. “There is a huge conglomerate, with people from different political cultures. Because of this mull the scale of lobbying or, to speak bluntly, corruption, is huge. Such actions are a blow to our national interests under the guise of noble ideals. Often, lobbying firms have a huge influence upon the laws adopted in the EU. Large corporations have seen an easy way of looking after their interests. Corruption flourishes and this is very bad, because large concerns can block Polish small and medium-sized enterprises” – explained Ziobro MEP. Every year, cigarette sales generate revenues of over EUR 160 billion for the national budgets of the EU countries. This is much more than the costs of providing health care to patients suffering from tobacco-related diseases. “On the one hand, the budget is stripped of revenues, ostensibly for health protection reasons. On the other hand, we are deprived of tax revenues, which are partly used to finance the health care system. This is unacceptable, but some people just don’t get it” – said Grzyb MEP. Poland is particularly interested in blocking the directive. We are the biggest cigarette manufacturer in the EU, and the second-largest producer of tobacco. Last year, the State budget earned PLN 24 billion because of smokers, i.e. over 8 per cent of its total receipts. By comparison, the entire budget of the Ministry of Health is PLN 3.6 billion, which means that the tobacco sector contributes 2.5 times more than our entire spending on health care. The pharmaceutical sector is known for its not very ethical approach to business. In recent years, there have been many reports on the corruption scandals caused by this industry. In April 2011, Johnson & Johnson agreed to pay USD 70 million in penalties, following accusations in the USA regarding bribes paid to European physicians and the Iraqi government. In August 2012, Pfizer received a fine of USD 60 million for engaging in long-running corrupt practices involving medical professionals and public officials This pales into insignificance, compared with the amount which GlaxoSmithKline had to pay in July 2012. A court in Boston filed this company USD 3 billion for bribing physicians to prescribe children specific antidepressants. Jamie Whyte has written a fantastic book for the Institute of Economic Affairs that critiques what passes for "evidence-based policy" in Britain today. 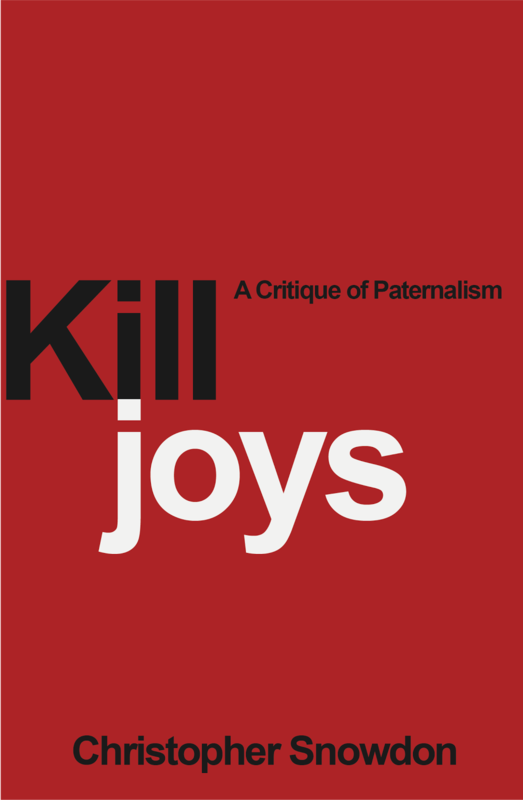 I've written about three of the main topics he covers myself (passive smoking, minimum pricing and happiness studies). Whyte brings a fresh perspective to all of them. It's free to download so stop what you're doing and read it now. The law must be changed to make it illegal for workers to sit for more than two hours at a time says a leading health expert alarmed at rising diabetes rates. 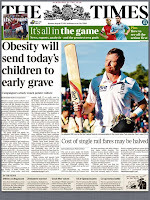 Professor Jonathan Shaw whose 12-year "AusDiab" study on the health status of 11,000 Australians calculates that 269 adults develop diabetes every day and says drastic measure are needed. "We need changes to occupational health and safety regulations so it is not allowed for people to sit for two hours at a time without a break," he said. Professor Shaw also advocated a tax on junk food, subsidies for healthy foods, standing desks in workplaces and stairs more accessible to encourage more physical activity. A rule banning sitting for more than two hours might not go down well with employers but they should "look on it as a long-term investment in their employees," he said. What does one do during a break from sitting? Running? Trampolining? Swimming? Welcome to the wacky world of lifestyle fascism, where 'public health' means 'private health' and taking a break means being forced to do vigorous physical exercise. San Francisco on Wednesday threatened to sue Nevada over the practice of "patient dumping," in which the state allegedly sent hundreds of indigent mentally ill patients on one-way trips to California. Sometimes the jokes just write themselves, don't they? San Francisco is now officially a dumping ground for lunatics and the mentally disadvantaged. Good luck trying to round up all the nutters in California, the home of electrosensitivity, multiple chemical sensitivity, thirdhand smoke and Stanton Glantz. I suspect this has been going on for decades. The jewel in the crown? The first decade of NHS stop-smoking services in England has been hailed a success by researchers. The team said the service was the "jewel in the NHS crown" after it helped nearly 146,000 people to quit between 2001 and 2011. I knew the NHS was in bad shape but I didn't think that things were so dire that being able to help a mere 14,600 people give up smoking each year was enough to become "the jewel in the crown" at the world's third biggest employer. There are about 10 million smokers in England. That means the service helped less than 0.15 per cent of them to quit, and some of them would have quit anyway. Trebles all round! How much does this thing cost? £84 million a year?! That's nearly £5,753 per quitter. We could buy 200 e-cigarette starter kits for that. It would be a hell of a lot more effective than dishing out nicotine replacement therapy and telling people to take one day at a time. But who are these impartial researchers that have painstakingly assessed whether the service provides value for money? Prof Robert West, who led the team, said stop-smoking services could be considered the "jewel in the NHS crown". Robert West undertakes research and consultancy for companies that develop and manufacture smoking cessation medications. He has a share of a patent for a novel nicotine delivery device. He is a trustee of QUIT. "It has been a real success. These services are important because the people who are using them are the heaviest smokers who are the least likely to give up. Actually, the people who contact smoking cessation services are more likely to give up than average. It's the ones who don't have any desire to give up and never seek assistance who are the least likely to do so. Despite the headline saying that this service is "a success", the outcomes are so obviously feeble that the BBC's number one public health brown-noser, Nick Triggle, has written one of his little editorials to paint it in a more positive light. It is easy to look at the study produced on the performance of the NHS stop smoking service in its first decade of existence and conclude money has been wasted. Indeed it is. The best part of a billion pounds, in fact. The unofficial target for the service is to get half of the people who turn to it for help to quit in the short-term - that is to say to give up for at least four weeks. Over all the NHS failed to achieve this in any of the years from 2001 to 2011. Never mind. Let's throw some more money at it, eh? 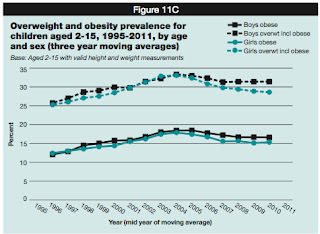 In fact, the data published on the British Medical Journal website shows if anything performance deteriorated slightly. Great. Close it down and spend the money more effectively on something else. But that would do the service an injustice. Go on. According to whom? Which economist have you contacted? Which disinterested third party has been on the phone? ...Martin Dockrell, of the Action on Smoking and Health campaign group. According to the figures for the year up to March 2011, the service made contact with about 8% of the nation's smokers. And only 0.15% of the nation's smokers gave up as a result, so that makes a 98.1 per cent failure amongst people who actively bothered to get in touch. That's even worse than the standard unassisted quit rate. Of course, only a minority end up quitting in the long term. Since the mid 1990s the numbers of smokers have been hovering stubbornly above the 20% mark. That's not quite true, is it? 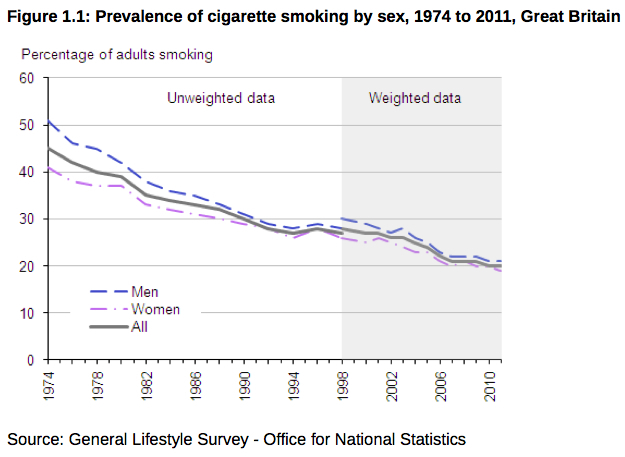 The smoking rate was falling quite nicely from the mid-1990s until 2007 when it reached 21 per cent. Then we had the smoking ban, graphic warnings, a ban on sales from vending machines, anti-smoking adverts with hooks in people's faces and a series of large tax hikes. The result is that the smoking rate fell by a mere one percentage point in four years, whereas before anti-tobacco extremism took hold it was falling at a rate of one percentage point per year. So it's now 20 per cent. 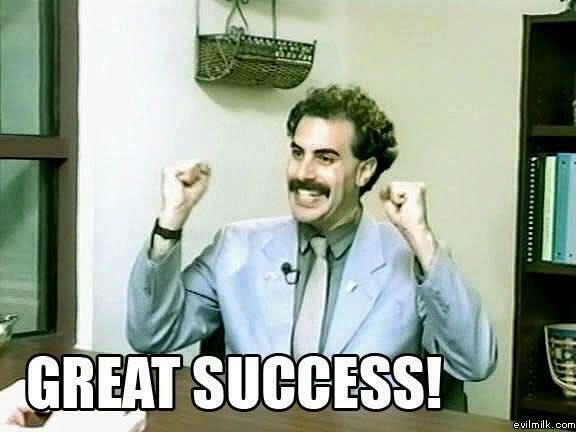 Great success! In recent years the numbers have come down by less than 1% a year. That is, I suppose, a technically true way of describing the pathetic failure of tobacco control in recent years. Some of that is down to smokers dying and the success of health campaigns in discouraging a new generation of smokers from taking up the habit. But some of it is undoubtedly linked to the success of the NHS stop smoking service - and that is why experts are hailing it as the "jewel in the NHS crown". Eyebrows were raised when a dominant anti-smoking charity in effect co-chaired a government announcement this summer on tighter regulation of electronic cigarettes. The relationship between Action on Smoking and Health and the Medicines and Healthcare Products Regulatory Agency, though, is closer still, City Diary has found. More than 150 pages of e-mails obtained under the Freedom of Information Act went back and forth between Deborah Arnott, ASH’s chief executive, and Jeremy Mean, the MHRA official who led the review of electronic cigarettes, in the six months leading up to the announcement in June. The pair were in contact on a range of matters, including a media appearance, EU policy formation and easing the entry of an e-cigarette company into Britain. Hours after the MHRA announced it would tighten regulation of e-cigarettes, Ms Arnott sent a rallying e-mail to Mr Mean. “To use Churchill’s well-worn phrase, this isn’t the end, it isn’t even the beginning of the end, but it is, definitely, the end of the beginning!" 150 pages of e-mails were exchanged between the two groups while the MHRA was coming to its decision?!?! Why on earth has the MHRA been collaborating with a special interest group on e-cigarette regulation? Why are a handful of extreme anti-tobacco activists stage-managing government announcements? Why the hell is Deborah Arnott sending Churchillian quotes to a senior MHRA official? 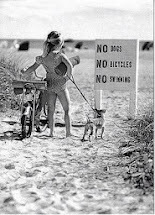 Does she see the destruction of the incumbent e-cigarette industry as her own personal El Alamein? ASH is a small political lobby group. None of its staff are scientists or have any relevant experience in toxicology. I can see no reason why the MHRA would seek the advice of a private interest group to this extent, nor why it should be arranging its press conferences. At the very least, there are questions for the MHRA to answer about why they were sharing confidential information with an outside lobby group like ASH. Who is pulling the strings at this organisation? Hundreds of young people have escaped death on Britain’s roads after laws were relaxed to allow pubs to open late into the night, a study has found. The number of crashes reported to police fell by 13 per cent, or 1,643 a month, after licensing laws were reformed in 2005, according to the first such analysis of official data. The decline has been felt most sharply among drivers aged between 18 and 25 and has been most marked on Friday and Saturday nights. Accidents involving young drivers at those times have fallen by 33 per cent. There are plausible reasons why extending opening hours might reduce road accidents but there are also plausible reasons why it might increase road accidents. The authors discuss them at the start of the study (PDF). First, extended hours may influence the intensity of drinking (the number of impaired bar patrons). Thus, if patrons spend longer at the bar and drink the same total amount as before the longer hours, the intensity could decline as they no longer drink to beat the clock. Alternatively, the longer period could allow a larger share of drinkers to become impaired and so intensity could increase. The second influence works through the amount and timing of driving among the impaired patrons. As we’ve suggested, the later closing hour may reduce the driving to illegal pubs or home parties as patrons stay in the pub. Moreover, if the bar no longer goes instantly from full to empty at the early closing hour, there may be fewer impaired drivers simultaneously on the road, even if the total number of impaired drivers is the same. In addition, the impaired drivers may now drive later in the night when fewer other drivers are on the road. While these influences may suggest fewer accidents, it could be the case that those who leave the bar very late have less access to public transit and are more likely to drive. 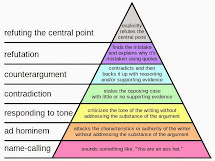 In the end, we find the arguments each way at least plausible and view the direction of the influence as an empirical issue. To get to the empirical meat, they use data from the Department of the Environment, Transport and the Regions "that contain all motor vehicle accidents reported to the police from 2002 to 2008 for all 416 local jurisdictions in the three parts of Britain." We know the type of accident (whether it caused either serious injury or a death), the date and time of the accident, location of the accident and the age of the driver of any vehicle involved in the accident. Critically, the data allow us to accurately assign accidents to the pre and post policy period. 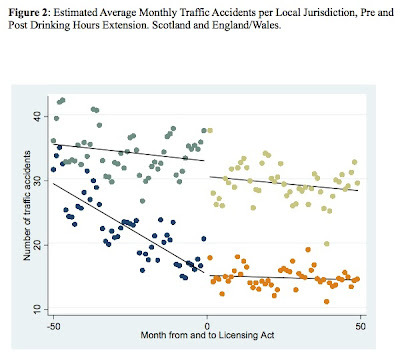 The results are striking and there are several reasons to think that the correlation with the Licensing Act implies causation. Firstly, there is a sharp reduction in road accidents in the months immediately following the start of so-called '24 hour drinking'. Secondly, the rate of accidents remains significantly lower than the pre-liberalisation period thereafter. Thirdly, the data from Scotland—used as a control—doesn't follow the same pattern at all. On the contrary, Scotland saw rates falling before the enactment of the legislation (which affected England and Wales, but not Scotland) and then flattening out. 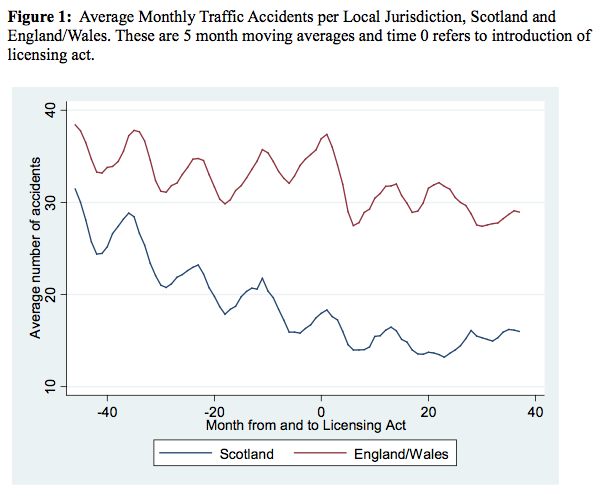 This suggests that there is no unidentified third variable that reduced road accidents in the UK as a whole. The authors conclude that "the policy is associated with a 9.8% decrease in the number of accidents per jurisdiction." The results are statistically significant and remain robust despite the researchers throwing numerous tests at them. Indeed, the results become stronger as they dig further into the data. It becomes clear that the decline in road accidents is concentrated late at night, at weekends and amongst young people. When we look at night hours the decrease is slightly higher at 14%. These night hours can be further divided into those on the weekends and during the weekdays. The weekday decrease is 12% as shown in row 3 while the Friday and Saturday decrease is 18% as shown in row 4. ... We next examine the hours of 9:00 at night to 3:00 in the morning on Friday and Saturday nights. 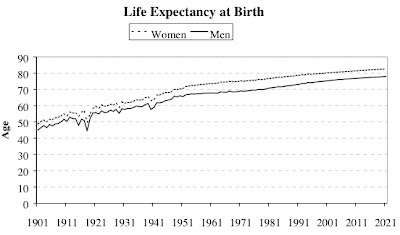 As shown in the fourth row of Table 3, the estimated decline remains statistically significant and represents a 23% decline. Similarly, an even narrower window of 11:00 at night to 3:00 in the morning on Friday and Saturday nights shows a nearly 24% decline in accidents. Thus, at the very hours when one might anticipate patrons would otherwise be simultaneously streaming out of bars and into cars, the new legislation allows them to remain in the bar and spreads out their dispersal with a large apparent decline in traffic accidents. ... The estimates reveal that the decrease in accidents associated with longer hours is concentrated almost entirely among young drivers... As a percentage decrease, a drop of .380 represents a 32.5% decrease for younger drivers on Friday and Saturday nights. While the coefficient is negative for middle age drivers, it is not statistically different from zero. The coefficient for older drivers is not significant, vanishingly small and actually positive. Thus, the clear pattern is that the age group most influenced by the policy change is the youngest drivers. It's interesting to compare this study with the crude ecological studies that I have often written about in the past (such as the English heart miracle, the Canadian minimum pricing scam and, most recently, the Colorado casino miracle). These studies use aggregate data such as hospital admissions and attribute the reported decline to legislation (invariably, legislation that the researcher supports). One problem with this approach is that there are all sorts of other variables that could confound the results. 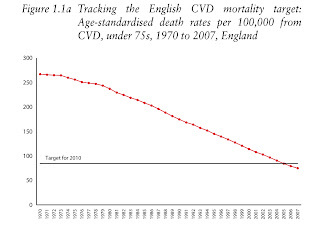 Another problem is that some outcomes (such as heart attacks) are in long-term decline and would have fallen with or without the legislation. In the case of road accidents in the UK, there is no doubt that they have been in decline for decades, albeit with significant fluctuations (they have risen recently, for example, and they were rising immediately before the Licensing Act came into force). The authors acknowledge this and their conclusions are based on a clear and sharp drop that coincided with the liberalisation of the licensing laws. But aside from taking the same basic approach, this study has nothing in common with the policy-based ecological studies that I have criticised in the past. The real problem with those studies is that they either cherry-pick a small sample of the population while ignoring the national data (eg. here, here and here) or that they are based on a computer model that bears no relationship to the actual data (eg. here, here and here). Sometimes they even pretend the legislation started when it didn't just to make the facts fit (eg. here and here). Oh, and they hardly ever use a control group. This study doesn't pull any of those tricks. 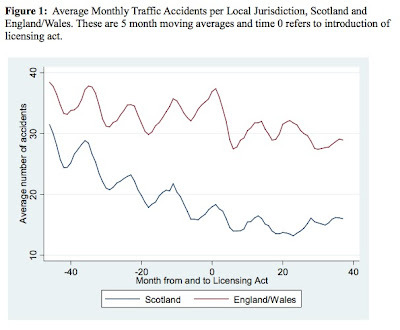 It examines all road accidents in England and Wales over a seven year period and compares them to a control group (Scotland) that is directly comparable. It shows a clear decline in rates directly following the enactment of the legislation and it shows that this decline was followed by a consistently lower rate thereafter. They show all this using real—not modelled—data and they compare the results in England and Wales with real data from another real country, Scotland, not with a hypothetical model of what might have happened in the absence of legislation. Moreover, the lead author is an economist who has written about a broad range of issues, not a single-issue campaigner with a known bias. Indeed, he has previously authored a study that reported a negative effect of the Licensing Act (ie. absenteeism). He kicks the wheels pretty hard with a series of tests to make sure the findings are robust. 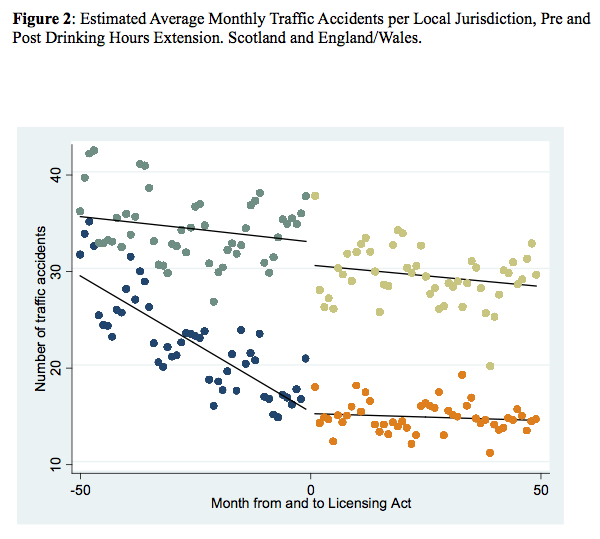 It could, of course, still be a coincidence, but the evidence that extending drinking hours in England and Wales had a positive effect on road accidents looks strong. So now it's the retailers' fault that people smoke? There is a great need to address the impact of tobacco retail outlets on the health of the NSW community, particularly in disadvantaged and remote areas. AMA (NSW) President A/Prof Brian Owler said, “The Cancer Council NSW report released today showed that there are five times more tobacco retailers than pharmacies in NSW and that there is a higher density of tobacco retail outlets in disadvantaged and remote areas." Since when did the ratio between tobacco retailers and pharmacists become a measure of anything? Does Brian think that people would buy five times as many bandages and aspirin if there were five times as many pharmacists? Perhaps he does, as he seems to think that people would buy less tobacco if there were fewer tobacconists. These are people who think you can make dogs happy by wagging their tails. “This is particularly alarming as people in disadvantaged communities are more likely to be smokers"
Anna Gilmore's latest effort has received virtually no press attention, but it's another gloriously inept entry into her canon. She argues that recent tobacco industry warnings about high taxes fuelling the illicit trade are hypocritical because nearly half the rise in cigarette prices is due to industry price-gouging. In November 2012, Japan Tobacco International (JTI), which has approximately a 40% share in the UK market, published a report, The Billion Pound Drop, on tobacco smuggling in the UK, which claims, inter alia, that tobacco tax increases fuel the illicit tobacco trade. Statements such as ‘the tax on a pack of premium brand cigarettes...has risen by more than £1... As a result, we have seen levels of non-UK duty paid consumption increase by almost 20% so far this year,’ litter the report. We took brand-specific cigarette price and sales data from Nielsen covering the period November 2006 to November 2009 in Britain... Table 1 shows that across this 3-year period, approximately half (48%) of the total price increase across all brands combined was due to the tobacco industry increasing prices, the other half (52%) being attributable to tax increases. From 2001 until 2008 tobacco taxes rose only in line with inflation. In 2009, tobacco duties were increased by 2% on the basis of a deflationary forecast in the Retail Price Index of -3%, thus representing a 5% increase in real terms. In 2010, the Chancellor announced that tobacco duty would rise by 1% above inflation for the current year and made a commitment to raising tobacco duty by 2% above inflation from 2011 to 2014. This was implemented by the new Conservative-led coalition Government in the 2011 Budget. In addition, duty on hand-rolled tobacco was increased by 10%. In 2012, the Chancellor raised tobacco duty by 5% above inflation. When we published our last report on the UK’s illegal tobacco market in 2010 we were greatly concerned about what might happen to levels of smuggling and cross-border shopping if the Government went ahead with a) plans to increase tobacco taxes and b) proposals to ban the display of tobacco products in retail outlets. Since then the tax on a pack of Premium brand cigarettes, for example Benson & Hedges Gold, has risen by more than £1, an increase of 20%, and now sells at £7.72 RRP1. As a result, we have seen levels of non-UK duty paid consumption increase by almost 20% so far this year. Gilmore could have easily obtained the relevant data for November 2009 to November 2012, but she chose not to. Funny that. Instead she goes back to the Blair/Brown years when the tobacco duty escalator had been abolished and tax on cigarettes was rising only in line with inflation. And why was the tobacco duty escalator scrapped in 2000? Because the illicit trade was getting out of hand. A lot has been written about the glorious success of minimum pricing in British Columbia this year, such as this from The Guardian. After studying eight years of data from British Columbia, detailing price rises, alcohol intake and negative health outcomes from drinking, Stockwell and Thomas concluded that "a 10% increase in average minimum prices across all beverage types would result in a 3.4% decrease in total alcohol consumption. ... Stockwell stresses that Canada's policy does cut consumption, and alcohol-related deaths and hospital admissions. " And this from the BBC. Dr Tim Stockwell, director of the University of Victoria's Centre for Addictions Research of British Columbia, said: "This study adds to the scientific evidence that, despite popular opinion to the contrary, even the heaviest drinkers reduce their consumption when minimum alcohol prices increase." The trouble is that the pesky facts keep getting in the way. At the weekend, Tim Stockwell's Centre for Addictions Research released a report (PDF) that called for all manner of temperance policies to be implemented, such as minimum pricing for pubs. I hope the quisling faction of Britain's hospitality industry are taking note. 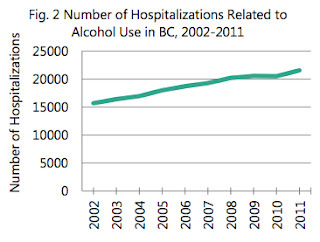 Alcohol consumption in BC has been above the Canadian average for the last decade. That's not what I heard. Surely the temperance lobby hasn't misled us? Although they don't show the data for alcohol-related deaths (which you can see in a previous post), what they do show does not suggest that minimum pricing has "helped curb drinking", or has "cut consumption" or has reduced hospital admissions. Quite the reverse. Perhaps minimum pricing has been a wonderful success on some computer model tucked away in Stockwell's office, but real world evidence once again confounds the conjurors of public health. Many readers will be familiar with the UK Centre for Tobacco Control Studies, the fruity campaign group that masquerades as a scientific research institution. State-funded with a bit of cash from Big Pharma thrown in, its staff includes "Red" Gerard Hastings, Anna "Dunce" Gilmore and "Lying" Linda Bauld. It advocates loony policies such as giving films that show smoking an 18 certificate—all because tobacco is a "unique product", of course. Seamless, eh? Sleep tight, drinkers. No slippery slope here. What better way to start the week than with some shrill scaremongering? Britain’s “couch potato culture” is in danger of raising a generation of children who will die younger than their parents, according to stark new figures. What "stark figures" would these be? Eighty per cent of children were not eating the recommended five daily portions of fruit and vegetables, yet half have chocolates, sweets and soft drinks every day, the research found. The five-a-day recommendation is entirely arbitrary and never had any evidence behind it. It only started to be used in Britain ten years ago. 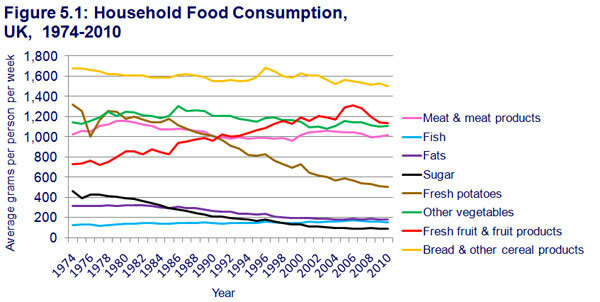 Since we don't know what proportion of previous generations ate their five-a-day, we have no reference point against which to compare them. 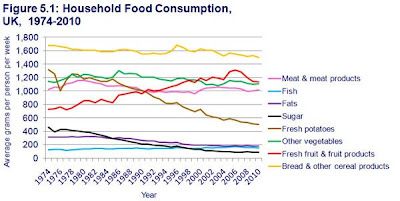 As a graph I showed in a recent post demonstrated, fruit consumption is much higher than it used to be and vegetable consumption has remained steady (except potatoes, which 'public health' folk don't consider to be proper vegetables because you can make chips out of them). 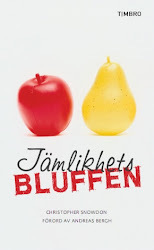 Read: if hysterical speculation based on the failure of children to consume an arbitrary quantity of fruit and veg does not demand a new prohibitions and tax rises, what will? Never mind that eighty per cent of adults also fail to eat their five-a-day and yet are living longer than ever. Never mind that these adults who are living longer than ever are also fatter than ever. Never mind that one in three children born today are predicted to live to the age of 100. 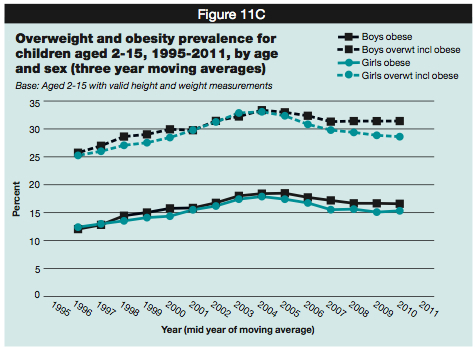 And never mind that obesity amongst children has already peaked and is falling. But what really caught my eye about The Times report was the president of the Faculty of Public Health's justification for the government to barge its way into our dining rooms. We have a duty to the state to be healthy, he says. It is a question of national survival and productivity. We don't exist to serve the state, Professor Ashton. The state exists to serve us. This is astonishing. During Anna Soubry's car crash of an interrogation by the House of Commons European Scrutiny Committee, she was asked to provide written evidence showing what effect Britain's vote had on the Tobacco Products Directive. It turns out that Soubry's decision to bypass parliament and take a personal decision to approve the legislation was absolutely critical. “The committee asked whether the UK’s support was vital to a General Approach being agreed” (at the Council of European health ministers meeting on 21st June)…..
Quite how one woman – sticking two fingers up to the UK democratic process – was able to waltz into a room and declare she was negotiating on behalf of the United Kingdom – when, in fact she clearly had no authority to do so whatsoever – will be beyond most people’s comprehension. That her role was then “decisive” in “forming a qualified majority” at the meeting will shock and infuriate in equal measure. Quite right. Here we have a junior minister single-handedly deciding the fate of a controversial piece of legislation that will affect hundreds of millions of people. In her own mind, the fact that the EU vote was finely poised made it imperative for her to cast the deciding vote without bothering with parliamentary scrutiny or democratic mandates. In fact, it makes her behaviour all the more scandalous. She made herself judge, jury and executioner despite not even understanding what she was voting for (see video below). The hubris and incompetence is breath-taking. She should resign immediately, as should her Department of Health accomplice Andrew Black. If they will not resign, they should be sacked and never be placed in a position of authority again. Ageing, you might think, comes with its own inherent long-term health risks - death, for one thing. There is a 'but' coming here, isn't there? What could it be, this fate worse than death? But a new study, funded by Age UK, has warned that too many over 65s are bingeing on alcohol and should be set lower safe drinking limits. Yes, it's another government-funded charity commissioning research to fuel the nanny state. A team of academics from Newcastle and Sunderland Universities have published a paper which looked into why elderly people are drinking at hazardous or harmful levels. The study, published in the journal PLOS ONE, found that many older people do not recognise they are heavy drinkers because they do not see themselves as dependent on the bottle. 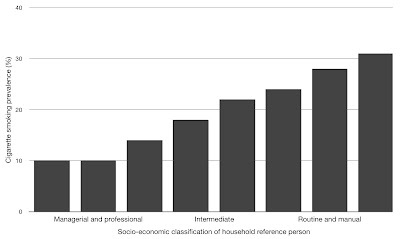 The academics interviewed focus groups with 53 men and women aged 65 to 90. The aim was to find out the reasons why so many of people in that age group continue to drink to unhealthy levels, and to reveal their attitudes to alcohol. And what were the findings? The answer it seemed was simple, they did not care. Right, that's that sorted then. End the article and turn the page. There is nothing more to say. They like drinking and they don't care if it's unhealthy. Case closed. And when advised it would be better for them to drink less questioned the health practitioners. Ha, ha! Good for them. One woman drank a bottle of wine every day, about 63 units a week, but said she did not have a problem because it did not have a big effect on her. “If somebody found me in the corner drunk that would probably shock me into stopping but that has never happened,” she said. Others who were interviewed talked of having “skinfuls”, or five or six pints, and thought there was no problem with that because they did not suffer any immediate adverse effects that they linked to drinking. Quite right too. Their lives, their choice. Is it too much to ask for people who are in their 70s and 80s to be treated like adults? And when, prey, are these "long-term" effects finally going to hit them? When they're 100? 120? 150? Is it any wonder these elderly people "do not care"? Previous studies have shown that older drinking is a worsening problem. No, they haven't. 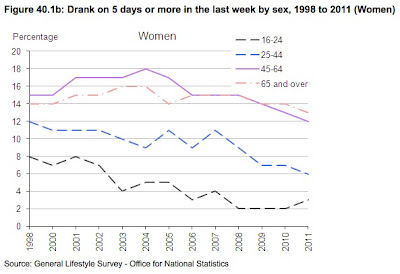 They've shown a rise in drinking amongst old people. That's only a problem if you believe that older people drinking is problematic per se. I think it's wonderful that pensioners have the disposable income to be able to afford pleasures in life such as drinking. 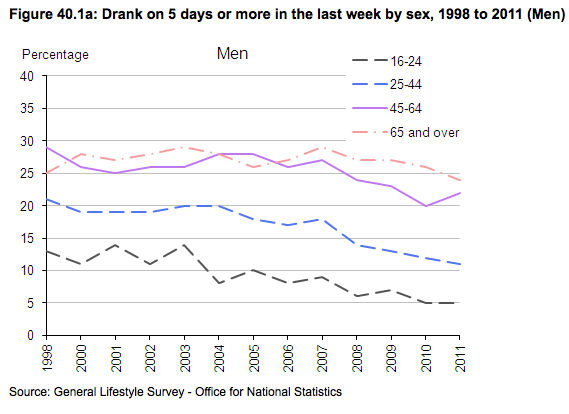 In England, 28 per cent of men and 14 per cent of women over 65 now drink alcohol more than five times per week. They did a few years ago. Rates have been dropping more recently, as they have amongst every age group. 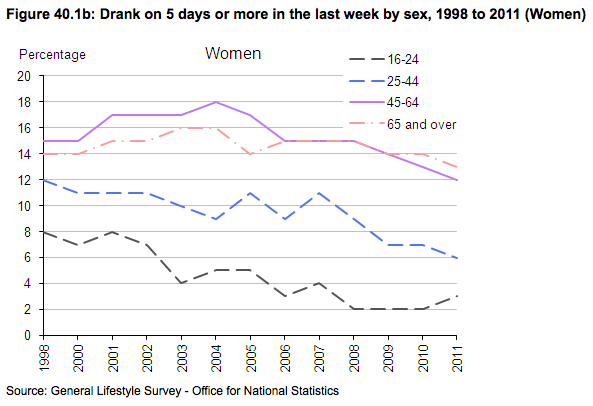 The latest data is here, shown under the subheading 'Decline in frequent drinking and heavy drinking'. 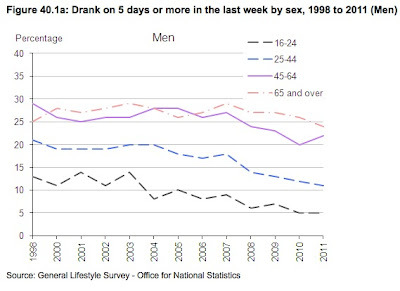 As the Office for National Statistics explains, older people drink little but often. In other words, responsibly. It was noted earlier that older people tend to drink more frequently than younger people. However, among both men and women, those aged 65 and over were significantly less likely than respondents in other age groups to have exceeded 4/3 units of alcohol on at least one day. ...Similar patterns were evident for heavy drinking (exceeding 8/6 units) older people were less likely to drink heavily than younger people: 6% of men aged 65 and over had drunk heavily on at least one day during the previous week, compared with 19% of men aged 45 to 64, 24% of men aged 25 to 44 and 22% of men aged 16 to 24. Among women the estimates for the corresponding age groups were 2%, 12%, 16% and 18%. Very heavy drinking (exceeding 12/9 units) was most prevalent in the 16 to 24 and 25 to 44 age groups. In the 16 to 24 age group, 13% of men and 12% of women drank more than 12/9 units, and 13% of men and 9% of women did so in the 25 to 44 group. In the 45 to 64 and 65 and over groups the estimates were 9% of men and 6% of women and 2% of men and 1% of women respectively. And so far public health messages about harmful drinking have not been as effective for the older age group as they have for the younger. Older people saw drinking alcohol as a positive way to relax and be sociable with friends and family. To the re-education camps with them! Don't let them back out until they see alcohol as an addictive carcinogenic drug for which there is no safe level of use. Chronic pain, loneliness and bereavement were identified as likely to lead to heavier drinking in later life. Fair enough, surely? If, God forbid, I live to ninety and some pipsqueak of a health researcher tells me to cut down on my drinking, I shall poke them in the eye with my walking stick. The biggest risk factor for virtually all diseases is age. For those who are elderly, every other risk factor fades into insignificance (which, perhaps, is why Leonard Cohen plans to start smoking when he's 80). It is no wonder that they "do not care" about the trivial health risks of drinking a bottle of wine a day. Rather it is a wonder that they don't drink more. Dr Katie Haighton, also at the Institute of Health and Society, Newcastle University, said: “Alcohol interventions are not working for older people for many reasons." 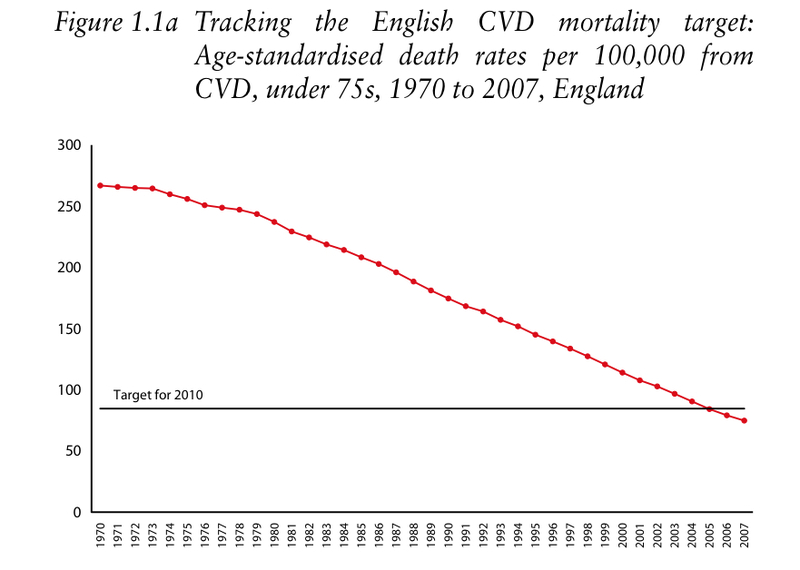 As I have said before, the 'public health' movement is really a longevity movement. It's supreme goal is extending life expectancy. It has no answer for those who are already very old, it has no answer for those who do not want to grow old and it has no answer for those who are bored of life or just don't care. Why can't they just leave them be? All the usual 'public interest' arguments against drinking fall flat when it comes to pensioners. Does it make them less productive? No. Does it lead to violence in city centres? No. Will it make them die young? No. So what's the solution to the stubborn refusal of pensioners to take lectures from a bunch of nagging whippersnappers? Yeah, that'll make all the difference to people who find the existing guidelines laughable, who "question the health practitioners" and who "do not care" anyway. 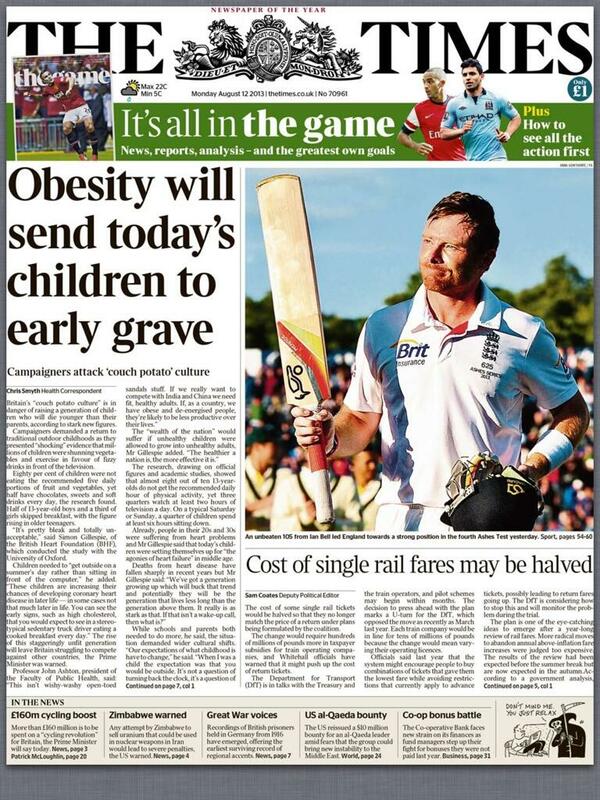 I doubt even the 'public health' lobby believes that reducing the guidelines will have any effect on behaviour. The intention is to move the goalposts, as they have with obesity, in order to produce future research showing a worsening epidemic of elderly drinking. This, in turn, will lead to calls for yet higher taxes and more restrictions on advertising and availability. Tee hee. Those unintended consequences, eh? Katie Haighton, one of the study’s authors, said GPs were loath to intervene, with many not wanting to deprive patients of enjoyment later on in life. I'm pleased to hear it, and not surprised. This confirms my long held view that rank and file GPs are usually sound and sensible. It's the psychologists, sociologists and epidemiologists of the oxymoronic 'public health' lobby you have to watch out for. Back in May, I mentioned that the anti-alcohol campaign group Balance North East—a classic sock puppet, founded and funded entirely by the government—had been granted £1.4 million by local authorities to continue its fraudulent astro-turfing. Balance North East's main activity is campaigning for minimum pricing, but it also does other things such as spending taxpayers money on drinking binges in cinemas. Balance, the North East Alcohol Office, carried out a number of test purchases in cinemas across the region and found that in some chains, people were able to buy six pints at a time and take them into an early afternoon screening of Despicable Me 2 (U) – and they were also advised that they could purchase more during the film. On another occasion, test purchasers were able to buy five pints of lager (5.1%) and take the drinks into a mid-afternoon screening of Monsters University (U). This equates to 14.5 units, which is more than the recommended weekly limit of 14 units for a woman. It would be more than the guidelines for a woman if one woman drunk all five pints, but—as the plural in "test purchasers" indicates—there were at least two people buying these drinks and we have no idea about their gender. Suspiciously, Balance doesn't disclose how many of their state-funded muppets were sent along to this film. I suspect at least five or six. – and in some chains, alcohol is clearly displayed and can be purchased at the popcorn counter next to sweets, soft drinks and other refreshments. So what? Is it illegal for cinemas to sell alcohol? No. Are they selling it to children? No. Is it illegal for alcohol to be "clearly displayed"? No. Is it illegal to drink in a cinema? No. So what in the name of Beelzebub's bathtub has this got to do with the government and its parasitic front groups? That is also not a crime and nor should it be, not least because—as is well known—those "recommended" limits were plucked out of thin air. Family films are dreadful. You need a stiff drink to watch one, especially if surrounded by the flotsam and jetsam of British youth during the summer holidays. Are Balance suggesting that alcohol should not be served unless the film has an 18 certificate? That certainly seems to be the implication. Since when did cinema popcorn, of all things, become the benchmark of good value? Give me strength. If I was a taxpayer in the North East—as I used to be—I would share the view of this chap, who wrote to the Northern Echo about this mob three months ago. I was interested to read that 12 hard-up North-East councils, presumably including Darlington, have found nearly £1.4 m each year for two years to fund Fresh and Balance, two public health campaign groups (Echo, May 8). This works out at approximately £116,000 per authority per year. Yet these groups have only one office and eight employees. The mind boggles at what eight people are going to spend such a huge sum on [now we know—CJS]. Stanton Glantz—junk science's gift that keeps on giving—has produced another study purporting to show a decline in acute illnesses after a smoking ban. This time, however, he's not looking just at heart attacks but at ambulance calls as a whole. So that's every serious bar room fight, every case of alcohol poisoning, every road accident and, yes, every heart attack. "The research shows strong evidence of a significant drop in ambulance calls due to less secondhand smoke exposure,” Glantz said. In fact, secondhand smoke was never measured, nor is there any record of why the ambulances were called. In keeping with his notorious Helena heart miracle, Glantz looked only at one small, rural community (Gilpin County) rather than the whole of Colorado. If he had looked at the whole state, it would have provided a much larger sample and would have allowed less scope for cherry-picking. Did ambulance calls really fall by 20 per cent? 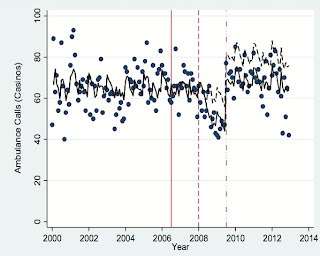 Although I would never trust any of Glantz's figures until I've seen the raw data with my own eyes, he provides a graph which suggests that a decline did indeed occur (the casino smoking ban is shown by the middle red line; the line to the right of it shows when casino hours were extended in 2009). Note that these are ambulances going to and from the casinos themselves, not the whole area. But here's another graph. It was published by the Denver Post after the smoking ban had been in place for six months. 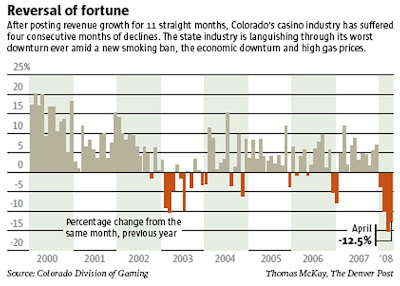 It shows revenue in the Colorado casino industry which, as it says, was "languishing in its worst downturn ever" in 2008. 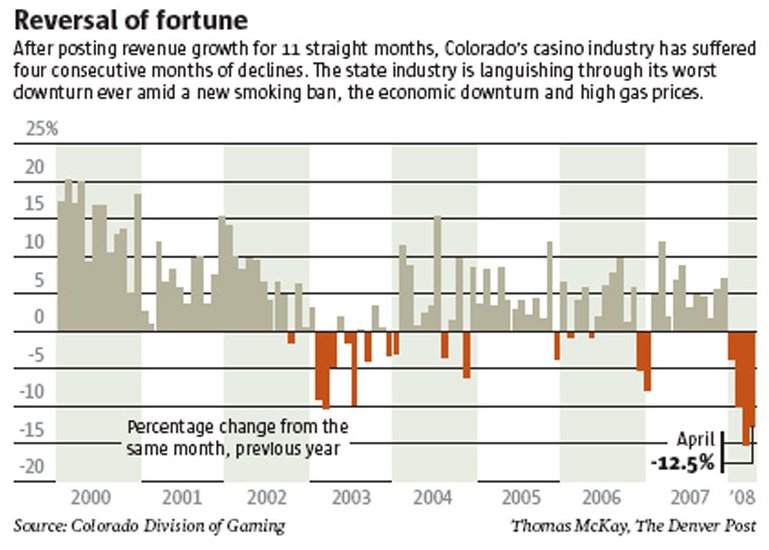 Colorado's mountain casinos are mired in their worst downturn ever, walloped by a smoking ban, high gas prices and a tightening economy that has cut into discretionary spending. While other states with commercial casinos, such as Nevada and New Jersey, are also struggling, Colorado's 10.7 percent revenue drop during the first four months of 2008 is the second-largest in the nation, according to an analysis by The Denver Post. "We might've had a few blips before, but nothing like this," said Marc Murphy, co-general manager of Bronco Billy's Casino in Cripple Creek. ...Murphy said he believes 75 percent of the current downturn is attributable to the statewide smoking ban that extended to casinos Jan. 1. Lower revenues in the casino business can only be the result of fewer people coming in and/or people staying for shorter periods of time. Golden resident Jane Painter said, between puffs, that she cut her trips from twice a week to once every couple of weeks because of the smoking ban. "It's not so much fun anymore," said Painter, 68. Inside the casino, Denver resident Paul Williams, 48, said his trips have dropped from twice a week to three times a month. Not only did revenues fall but four casinos went out of business altogether. Colorado has three fewer casinos operating this year, since four have shut down, while a new one recently opened in Cripple Creek. Thanks to smoking bans initiated in early 2008, Colorado and Illinois have sustained major dips in gambling revenue, according to experts on a panel Wednesday at the Global Gaming Expo. Gaming-tax collections in the Centennial State were off as much as 25.4 percent in the second quarter year over year in some jurisdictions, and as much as 53 percent in the third quarter year over year once you throw in the effects of a new, graduated tax, said Lois Rice, executive director of the Colorado Gaming Association. Colorado casinos took the second-largest revenue hit in the industry in 2008 with a 12.3 percent drop, according to a new report by the American Gaming Association. Only Illinois suffered a bigger drop with a 20.9 percent decline. The American Gaming Association attributed the states’ struggles, in part, to smoking bans that took effect last year. ...For 2008, Colorado casinos posted revenue of $715.9 million, down from $816.1 million. They generated $88.4 million in tax revenue for the state, down 23.4 percent from $115.4 million in 2007. Things got so bad that the government agreed to help them out. Colorado regulators are giving tax relief to some casinos hurt by revenue declines ranging in the double digits after smoking was banned. The Colorado Limited Gaming Control Commission approved the new formula Thursday. Casinos that have revenue between $4 million and $15 million a year will pay less next year. ...Casino revenue has declined every month this year in wake of a smoking ban that took effect in January. 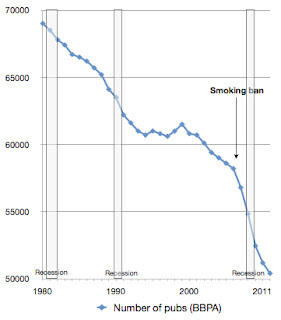 Of course, it is impossible to completely disentangle the effect of the smoking ban from other factors, such as the recession, but exact quantification is not necessary to demonstrate the fatal problem with Glantz's latest study. It is only necessary to show that casinos in Colorado saw a large decline in attendance at exactly the same time that the smoking ban came into effect. That such a drop-off occurred is beyond dispute. If you've got fewer people in the casino, obviously you're going to have fewer people needing ambulances. Incredibly, Glantz does not control for the fact that attendance dropped off after the smoking ban. Nowhere in the study does he acknowledge that the fall in ambulance calls from casinos coincided with "the worst downturn ever" in the local casino industry. How could he? Not only would it screw up his attempt to show that smoking bans reduce ambulance call outs, but it would also undermine his previous attempt to show that smoking bans don't harm the casino business. Oh, what a tangled web we weave. Do smoking breaks cost billions?